Being an expert hair restoration surgeon who has published peer-reviewed book chapters on hairline lowering and hair transplantation, double board certified facial plastic surgeon, Dr. Jason Champagne, is continually staying up-to-date on the latest technologies in the field. One procedure in which he has proven his expertise and is still one of the best treatments to combat thinning hair is Hair Transplantation. Bottom line, it gives your hair greater density in your problem areas with natural-looking results. Whether you are male or female, hair loss can be a source of great concern and anxiety, so if you are looking to correct thinning hair, or even thin, patchy or absent facial hair, Dr. 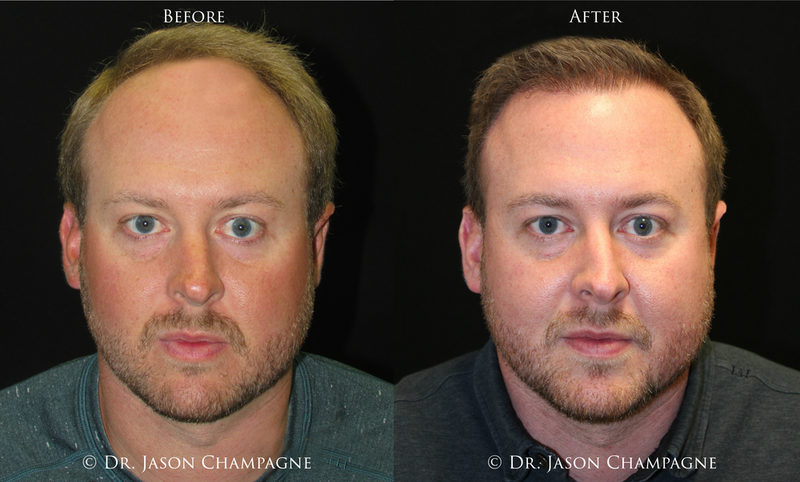 Champagne performs hair transplantation to the head and also the eyebrows, mustache and beard area. Please contact our office to schedule a personalized, confidential consultation with our expert hair restoration surgeon, Dr. Jason Champagne, where he will address your goals and answer any questions you may have regarding hair transplantation or any other procedure we offer.